Authored by Mr. Robert D. Steele. 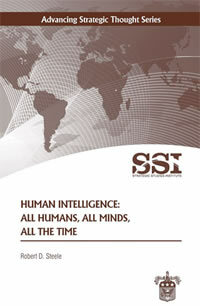 The author explores the centrality of Human Intelligence in meeting the needs of the U.S. Army, the Department of Defense, and the whole of government. Such intelligence is essential to create a national security strategy, to define whole of government policies, to acquire the right capabilities at the right price in time to be useful, and to conduct local and global operations. He outlines 15 distinct types of HUMINT, four of which are classified (defensive and offensive counterintelligence, clandestine operations, and covert action), with the other 11 being predominantly unclassified. The author offers the U.S. Army an orientation to a world in which thinkers displace shooters as the center of gravity for planning, programming, and budgeting, as well as the proper structuring of mission mandates, force structures, and tactics and techniques to be used in any given mission area.